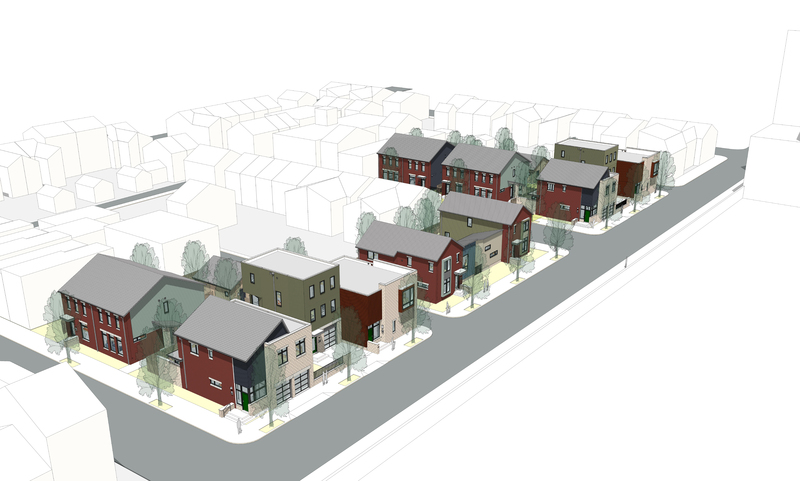 In this redevelopment of a former industrial site in Pittsburgh’s Lawrenceville neighborhood, 14 single family and duplex houses are integrated into one composition of dynamic urban streetscapes and garden rooms. While the density is lower than the surrounding context to accommodate off-street parking and outdoor living, the house to street relationship is consistent with the neighborhood. Houses and garden fences define the public realm of the street and enclose the private realm of courtyard gardens. The six house types are all compact, efficient, and economical in order to lower the bar to new homeownership. A strong emphasis is placed on connecting open loft living space directly to outdoor living space. All houses are slab-on-grade, two-story wood frame construction and incorporate integral or detached garages. Each of the houses has a private garden enclosed by a blend of buildings, fences and hedges. Together the private gardens create a lively landscape on the interior of the block that is visually shared by all the houses as well as passersby on the street. The architecture of the houses synthesizes forms and materials inspired by both the residential and industrial vernacular of Lawrenceville. The character of the houses complements the neighborhood while envisioning a fresh take on urban living.